James Cameron is preparing to release Terminator 2: Judgment Day in a 4K 3D conversion that is expected to blow minds in the same way that it did when it was originally released back in 1991. The director has recently said that he made a change to the iconic movie during the process of prepping the 3D release. At the time, Cameron's second installment in the Terminator franchise was the most expensive movie ever made, costing $102 million dollars. The gamble paid off as the movie became a box office smash and was critically praised for the stunning and groundbreaking visual effects. But was Cameron tempted to change anything around drastically like George Lucas did with the original Star Wars trilogy? James Cameron recently sat down with Entertainment Tonight and revealed that he had to change one detail that has been bothering him for quite some time. But in regards to going and pulling a George Lucas and ruining classic movies, Cameron said, "I've changed as an artist. Why would I want to second guess myself on what I was thinking back then?" One has to wonder why Lucas didn't feel the same way when he "revised" the original Star Wars Trilogy 20 years ago. Fans of Terminator 2 will remember the epic canal chase scene where the T-1000 is chasing after young John Connor in a tow truck. The tow truck does a dive-bomb into the canal and upon impact, the windshield pops out of the truck, except in the next shot, the windshield magically reappears. When talking about the scene Cameron said, "It just bugged me," while laughing. So Cameron had the windshield falling out taken out when the movie was being restored, which is understandable and not nearly as offensive as what George Lucas did. Cameron also hinted that if the 3D version of Terminator 2 did well, that he might consider doing a version of Aliens in 3D. 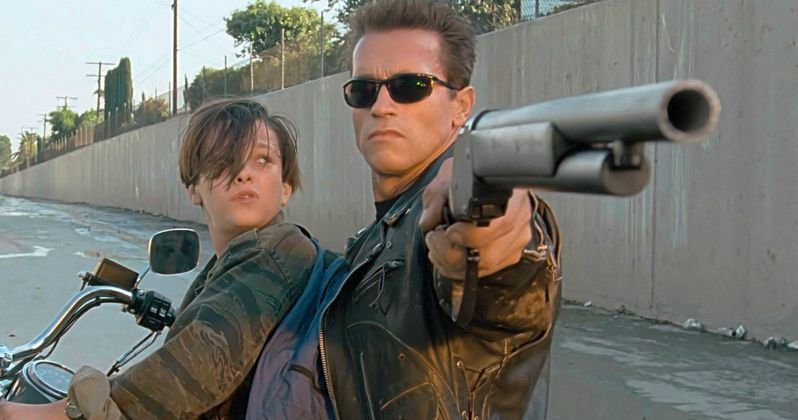 The 4K 3D restoration of Terminator 2: Judgment Day is reportedly a huge upgrade for a movie that was already visually stunning, even with the tampering of the windshield. The news comes after it was announced that Arnold Schwarzenegger will play a human T-800 prototype in the new Terminator movie. Cameron spoke about the origins of the T-800 prototype and wants to explore where it came from, so Schwarzenegger will return, but as a human character that was the basis of the T-800 Terminator models. Terminator 2 3D stars Arnold Schwarzenegger in his most iconic role in what is arguably the best movie in the Terminator franchise and now we'll get a crack at seeing the movie in the best quality available, in immersive 3D with a 4K makeover. The 3D version of the movie is set to hit AMC theaters on August 25th, 2017, which is 20 years after Skynet originally went live. While waiting for the new 3D transfer of Terminator 2, you can check out the trailer below, which includes Cameron talking about the process of the transfer.